Built to impress, the HotBox™ 5 RGBVW offers phenomenal RGBW+UV color mixing, advanced electronics, and a huge amount of light output that will really get the crowd jumping! 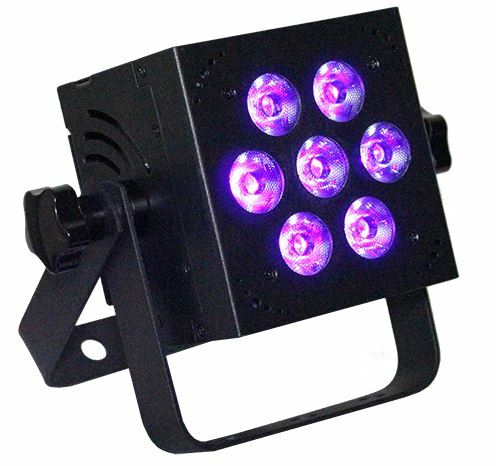 The HotBox™ RGBVW puts out a ton of light from its 7x 15-watt 5-in-1 LEDs, and features 4/5/9 or 10 user selectable DMX channel modes, which means it works great with any type of controller. In DMX mode, users will have full control of RGBW+UV color mixing, 31 built-in programs, ultra smooth flicker-free 32-bit dimming, and even easy HSV color mixing ability in 4-channel DMX mode. It’s easy-to-use 4-button LED control panel also allows total control over the fixture including master/slave settings, sound active mode, built-in programs, auto mode, custom color mixing, and user adjustable fade/strobe effects for a totally rocking light show. And the HotBox™ RGBVW also comes equipped with industry standard powerCON® compatible power input/output & 3-pin DMX connections! And like all HotBox fixtures, you can take also full advantage of Blizzard’s wiCICLE® wireless DMX system without the need for external power thanks to the wiCICLE enabled DMX jacks! An innovative design provides power to the system directly from the fixture’s DMX jack, meaning even fewer cords and less setup time. This HotBox™ is packed with a ton of features, for not a lot of ice!